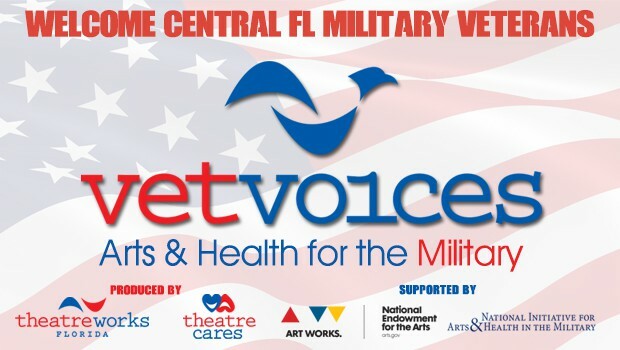 DAVENPORT, FL – TheatreWorks Florida’s highly acclaimed community outreach program, TheatreCares, is proud to announce the launch of their all-new inspiring program, Vet Voices. Vet Voices is a free theatre arts program for disabled military war veterans that enlists creative arts therapy through active participation in workshops and events. Vet Voices has been 1 and 1/2 years in development and has finally been launched in Davenport for all of Central FL. Vet Voices is not a project but an ongoing “arts and health” program for Central FL disabled military war veterans that nurtures life-long healing and learning through the art of live theatre. The program will provide veterans an opportunity for positive self-awareness and self-discovery in a creative “safe space” environment. Participation in a wide scope of workshops and events will allow veterans affected by war to explore the theatre arts and ultimately find healing through creativity. The end result will combine theatre professionals with veterans on stage in a fully produced, original musical play, developed by the veterans themselves, that incorporates creative writing, music, songs and visual art generated from the workshops. The Vet Voices program is free of charge to military veterans of war (Active, Retired, Reserve and National Guard), their families and their caregivers in the Central FL region. A final presentation of creative work will be presented to the Central Florida public in a continued effort to create an awareness of our war-time veterans and the health issues they deal with on a daily basis as well as how they adapt to normalizing their lives after war. Recruitment to the Vet Voices program is already in progress. In its first year, the program cutoff will be 30 participants. For more information please visit TheatreWorks Florida’s website at TheatreWorksFL.org or contact Abel Gonzales, TWF Company Manager, at: vetvoices@theatreworksfl.org | 407.340.0473. TheatreWorks Florida received a $10,000 grant for Vet Voices in February 2018 from the National Endowment for the Arts (Challenge America) that finally brings the program to life. Vet Voices is also in the middle of a $25,000 grant review process with USA Today News (Gannett Foundation) that requires TheatreWorks Florida to raise $3000 to prove program sustainability before a final review is made in June 2018. Deadline to raise the funds is May 10, 2018. To help TheatreWorks Florida raise the $3000 through online donation, Click Here. Vet Voices creative partners include high profile national agencies such as: National Initiative for Arts & Health in the Military, Americans for The Arts and NEA Creative Forces. The program has also begun outreach partnerships with James A. Hailey Veteran’s Hospital (Tampa, FL) and Lake Nona VA Hospital (Orlando, FL). TWF Key Designers and Staff: Scott A. Cook (Artistic Producer-Director), Mark S. Graham (Associate Project Director), Shannon Kropf (Music Direction), James F. Beck (Scenic & Lighting), Ty Menard (Props/Set Decoration), Mandy Brumby (Costumes), Heather Franklin (Hair & Makeup), Brad Breaux (Audio Operator), Jennifer Roman (Production Manager), Abel Gonzales (Company Manager/Military Consultant), and Alexis Senge Johnson (Development Director). LEARN MORE ABOUT VET VOICES IN 8 MINS! TheatreWorks Florida is a 501(c)(3) professional Central Florida-based theatre company. Formed in 2007, TheatreWorks offers some of the finest theatrical musicals available today as well as produces new, original works from area artists and artists from around the country.